Large historiated initial D on a leaf from an Antiphonal. This initial D shows St. Agnes, identified by her attribute, the lamb of God, in the company of another saint, who holds the palm of martyrdom. On the eighth day after her death, Agnes appears to her parents who both point at her in quiet resignation. As they both had been lying on her tomb prostrate with grief, they now realize that their daughter's sacrifice has been rewarded in heaven, where she is in the company of God's son and other saints. The scene is painted on a brightly burnished gold ground, within a grey frame. Border decoration on three sides consists of coloured acanthus leaves with knots and bright gold bezants. The leaf includes the text and music for the office for the Feast of St. Agnes (21 January), and belonged to the Sanctoral volume of what must have been a series of spectacularly illuminated Antiphonals. The artist is the Master of San Giovanni Fuorcivitas, named for his work for the Church of San Giovanni Fuorcivitas in Pistoia (Pistoia, Archivio Capitolare del Duomo, ms. 488/100). He collaborated with the celebrated Pacino di Bonaguida (c. 1280-early 1340s) and the Master of the Dominican Effigies (fl. 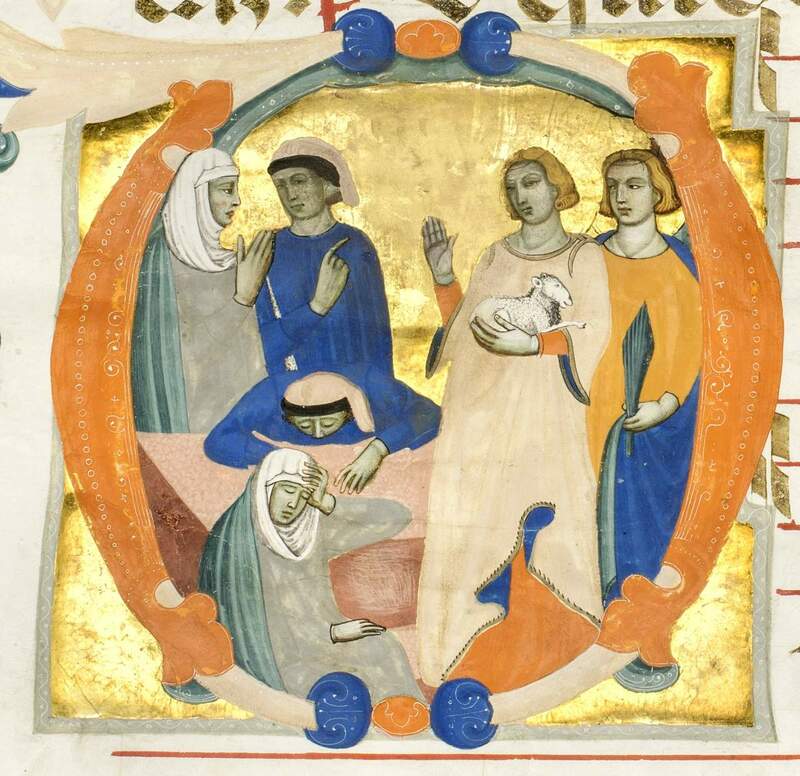 c. 1325-1355), when working on choir books for the Basilica of Sancta Maria all'Impruneta, near Florence.